Alright guys, it’s time for another beauty post. 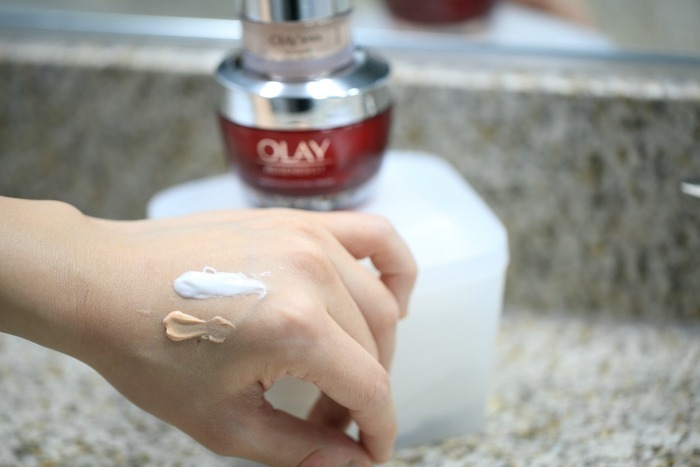 I’m over the moon excited to tell you about Olay’s 3-step reset. They’re one of my all-time favorite skincare brands so I’m stoked to partner up with them again – I blogged about their 28 day challenge a while back. Real talk: I got a little off track towards the end of 2017 – the holidays are always a cray time – but 2018’s all about new year, new you…or new me in this case, ha. I’m being a good girl now for sure though. In addition to my new regimen, I’m being much stricter with my diet and exercising daily. It’s been a challenge, but I already look and (most importantly) feel so much better. 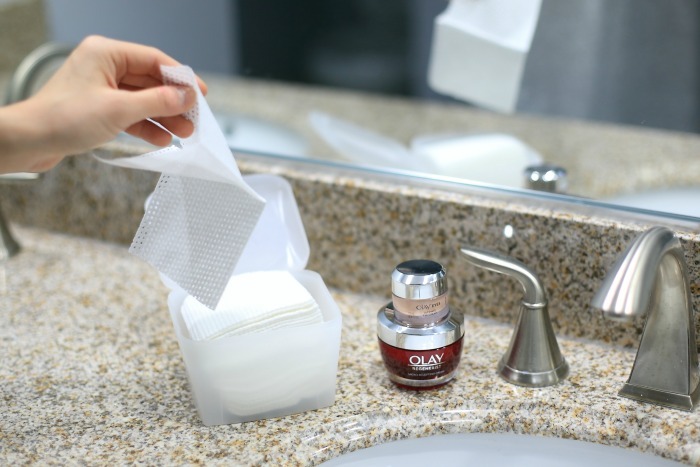 Olay Daily Facials: Obsessed with these 5-in-1 sheets! They do SO much more than just remove your makeup. They deliver a complete clean by cleansing, exfoliating AND hydrating, which I love. Think of them as mini-facials that remove dirt and oil. 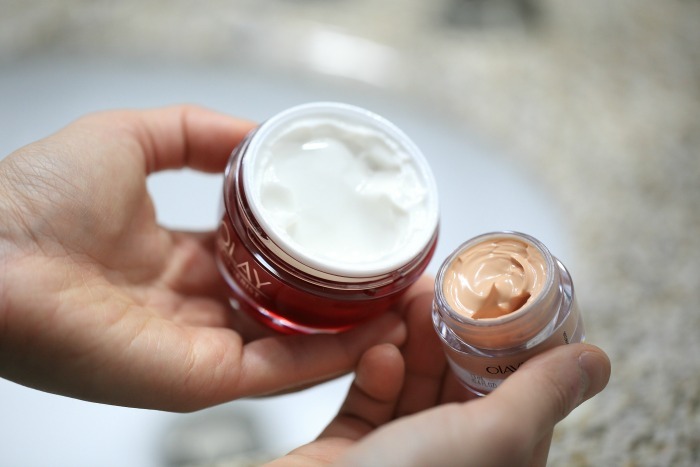 Olay Regenerist Micro Sculpting Cream: I don’t know how much more I can rave about this cream. I’ve been using it for YEARS, and I’m still a fan. It immediately plumps my skin for a naturally glowing complexion, and it honestly hydrates better than $200 or even $400 high-end face creams. You’ll see increased hydration within a week and notice changes in texture and elasticity in two. 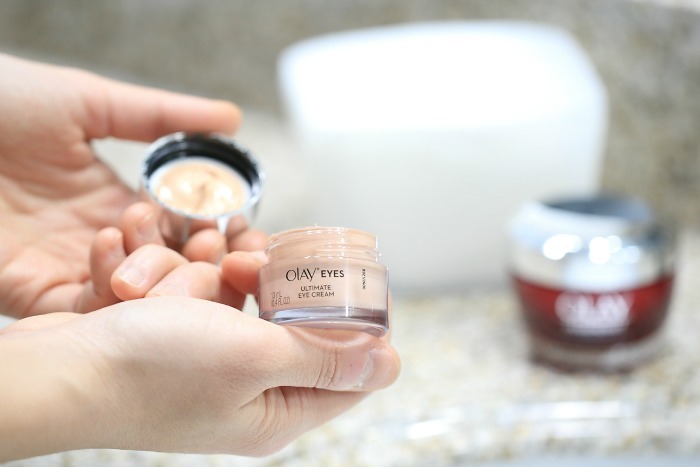 Olay Eyes Ultimate Eye Cream: This affordable eye cream contains powerful vitamins and peptides that hydrate and smooth like nobody’s business. It’ll help reduce puffiness and dark circles, and it even acts as a faux-concealer due to its color-correcting technology. I start my routine off by lathering my 5-in-1 sheet with water! I love the way this feels on my face, and the exfoliation does wonders for me. 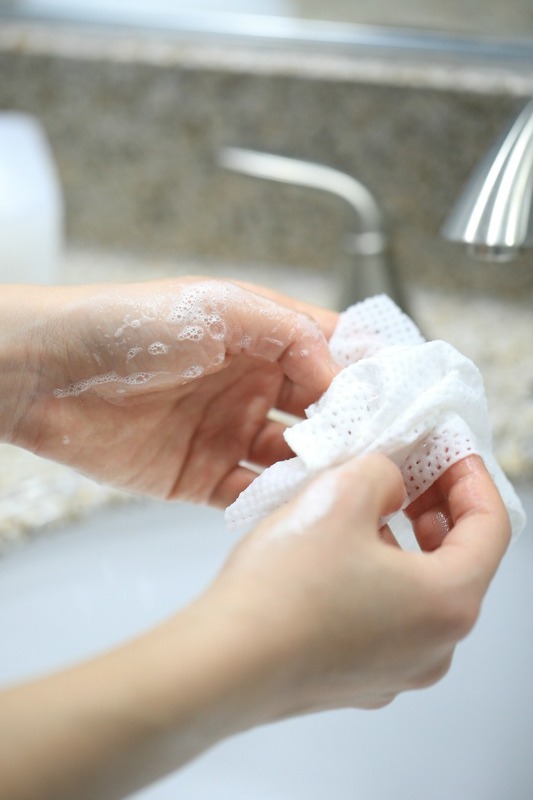 I rub it until it gets nice and soapy and use it to cleanse thoroughly – I use gentle, circular movements when doing so. Key word: gentle. This is especially important when you reach your eye area. The skin there is SO much more sensitive than anywhere else so you want to be extra careful when applying pressure. Afterwards, I use a dime-sized amount of their Regenerist Micro Sculpting Cream. I put dots on my forehead, cheeks and chin and then pat upwards to fight sagging. I let that sit for a minute or two before applying eye cream. Like most, my face gets drier during the wintertime so this cream is imperative to my skin’s health. Never skip moisturizer – it takes 2-3 minutes to apply and makes a world of a difference. I mentioned earlier that this works better than $400 face creams. I know it’s a bold statement, but I firmly stand behind it. I’ve used this product since 2012, and I swear by it. I’ve used it well before – like I said, we’re talking years – I became an Olay ambassador so please take my word for it. I’d never recommend something I didn’t absolutely love. I then finish my routine off with eye cream. Because this area’s so sensitive, I use my 4th finger for application. Do NOT use tons of (unnecessary) pressure. In fact, pretend you’re touching a newborn, ha. I laugh, but I’m being 200% serious. The last thing you want to do is assist the formation of wrinkles. Anywho, a little goes a long way with this product so go easy. I love the 3-step reset because it’s effective, efficient and affordable. My new routine takes 10 minutes tops so I can fit it into my ultra busy schedule easily – no excuses. My skin feels so much better with this regimen, and I’ve noticed clear changes. The texture of my skin has greatly improved, and I have a definite glow. My skin legit feels quenched, and I love it because I always feel so dry during the winter. What are your biggest skin concerns? Just wanted to show you the consistency of the aforementioned products. So much richness! So what do you guys think of my skincare routine? And would you give the 3-step reset a shot? Let me know by commenting below. You can learn more about the #3StepReset Here: http://spr.ly/Proof39 A big thanks to Olay for sponsoring this post, Sung Shin for shooting these killer photos, and you guys for taking the time to read! Sending hugs from the DMV. I love Olay products. I have to checkout their eye cream.